Noxious weeds--and any weeds for that matter--masquerade as pretty flowers in both the garden or in the native landscape. Alien to our state and the US, they occupy space and take up soil nutrients necessary for native plants to thrive. Noxious weeds arrived in our state accidentally or as escaped ornamental plants. It's important to familiarize yourself with noxious weeds. Noxious weeds are aggressive and can invade crops as well as native plant communities. Noxious weeds may also carry insects that are non-native species. Some noxious weeds can even be fatal to horses or cattle. In general, noxious weeds threaten wildlife habitat and natural resources. The Colorado Noxious Weed Act requires all Colorado residents to control noxious weeds that can be damaging to land the land of neighboring properties. Weeds are classified in four categories: Lists A, B, or C. There is also a "Watch List" that changes annually. There are multiple resources to help identify noxious weeds. Look at the USDA Plant Database or the visit Colorado Department of Agriculture's website for more information. You can also check out the additional resources and links listed on our Home page, or visit the Colorado State University Extension office or Conservation District office nearest you. CDA has two apps for using in the field: The Colorado Weed ID app and the EDDMapS West app. The Colorado Weed ID app offers on-the-fly weed identification with photos and full plant descriptions. The EDDMapS West app allows users to submit a GPS-tagged photo with a report; save and upload reports online, identify species of concern using images and descriptions, and access a glossary of plant ID terms. 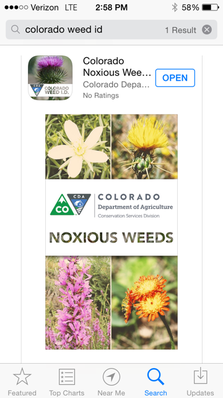 Download the free Colorado Noxious Weed ID app and EDD MapS West app. Click here for more information.